Guests can sleep well, whether on Japanese futon or on Western-style beds. A day filled with the pleasures of travel passes quickly by and is about to close, when you suddenly realize it is already past bedtime. Lying down, chatting or reading on clean soft bedding, feeling cozy in the afterglow of your travel, you will soon slip into a world of dreams and sleep soundly, looking forward to the pleasures that tomorrow will bring. In a washitsu (tatami-mat room), futon, Japanese-style mattresses and bedding are spread out over the tatami mats. Guests often say just how well they sleep on the futon of the ryokan, perhaps because of the well-starched sheets and pillow covers. At a ryokan, attendants take care of putting out the futon. Efficiently and carefully, they prepare the bedding so that guests can enjoy a good night's sleep. 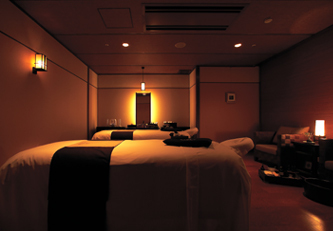 For those who can sleep only on a bed, some ryokans have guestrooms with a Western-style bedroom. What matters is that guests can sleep well, whether on Japanese futon or on Western-style beds. Outside the ryokan, taimatsu (pine torches), t-or-o (lanterns) or kagari-bi (watch fires) remain lit until dawn, making the guests feel at ease so that they can sleep well. Feeling cozy in the afterglow of your travel Attendants take care of putting out the futon.